Why do I take photos of interesting birds way down in East-Africa, while many of those birds are migratory and also come to The Netherlands? The same species of plover, heron and hopoe (though very rare here in The Netherlands) live both in Africa and Western Europe. And there are tons of those migrating birds, but I'm not that good at naming them all. I'm not a 'birder'. And both my East-African Birds and Dutch Birds books are migrating too. Outside of my house. In the countryside near Leiden in the province of South Holland there are many meadows that are protected this time of year. It gives a good place for a lot of waders and sandpipers like the Northern Lapwing (Kievit) to nest without being disturbed by agricultural activities. In those damp meadows you can also see a lot of Black-tailed Godwits (Limosa limosa; Grutto in Dutch). Out of all Black-tailed Godwits in North-western Europe 90% broods in The Netherlands, so the protection of their habitats is important. 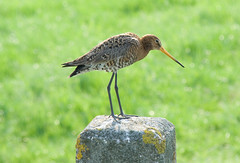 At the moment the Black-tailed Godwit is listed as Near Threatened by IUCN's Red List for endangered animals. Between 1990 and 2000 the populations declined with 50%, which is quite drastic. I like to see these birds in the fields. For me they were just birds from a book. One of those infamous waders you never see. But recently - being out in the countryside a bit more - I've seen and heard dozens of them. Quite cool! 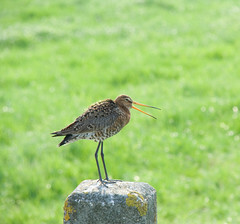 The ones nesting in The Netherlands at the moment are the subspecies Limosa limosa limosa or European Black-tailed Godwit. This one was not as shy as others and posed on a pole of a fence next to the road I was cycling on (yes, it's The Netherlands, fun to cycle around). Happy with the shots, though it was right into the evening sun, which is less optimal. But got some good detail!